Lisa Corinne Davis's nine paintings here read like haphazardly rendered topographies, or atlas pages warped and smattered with beautiful burgeoning mold. Lines, both rigid and winding, navigate across the composition, interrupting, intersecting, and unexpectedly deferring to biomorphic shapes. Cartoony, bulbous masses wrestle with angular counterparts. 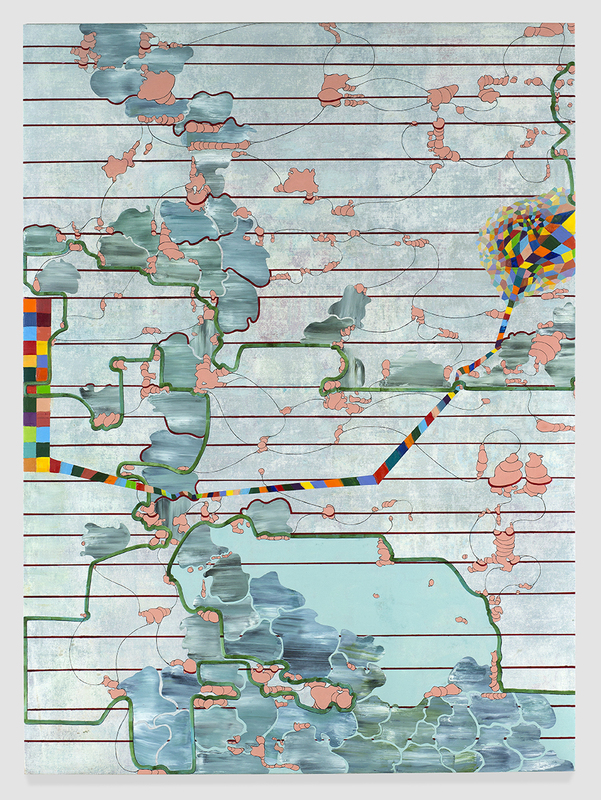 Each piece charts the tensions between abutting spaces and disparate forms, but titles including words such as "psychotropic," "specious," an "spurious," undermine their reliability as "maps." In Psychopathic Territory (2015) parallel lines wind like subway track beneath a bulging grid overlaid with yellow, orange and red squares -- evoking the color-coded evacuation zones of a city preparing for a flood. In Psychotropic Turf (2015), a blue-green continent is divided into interlocking countries by a network of tenuous borders. A pixelated storm system in rainbow colors brews over a pale ocean sliced longitudinally and marked by flesh-colored islands. In Capricious CIty (2014), four orange masses twist like roots under and over a net of strict blue lines. Black patches grow across everything like malignant lichen. On every canvas and panel, the fractured and tangled abstractions were beautiful reminders of the delicate balance between organic chaos and linear order. The tension was palpable.